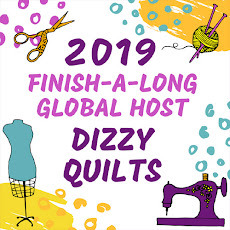 When Debbie of A Quilter's Table announced on Instagram that she would be hosting a quilt-along for her Crosscut Quilt, I knew I had to get on board. The timing couldn't have been better because I'm on vacation for two weeks. I went with a black background for my quilt because I already had 10" squares in my stash and decided to use yellow and orange scraps for the bars. This is what the top looked at after I made the original blocks. After sewing the blocks together, I have to say, moving onto the next steps was pretty difficult because I really liked it. But this is what it looked like after cutting my new "fabric" into 6.5" squares and sewing those together. For the quilting, I knew I would have to use my orange Aurifil in 40wt so it popped, but wasn't sure if I should use straight lines or FMQ. In the end, I decided to use a radiating design I've used in the past and I'm quite pleased with the effect. I find the quilting adds another dimension to the quilt and the orange thread is just perfect! This was not at all what I needed to be finishing this week, but I'm so glad I did it. This little 24" square quilt is probably going up on a wall somewhere in the house. If you would like more information on the Crosscut Quilt or make one of your own, check out @aquilterstable on Instagram. All of the instructions for making the quilt are on there. Also, check out the #crosscutquiltalong hashtag on Instagram to see everyone's version of the quilt. I will be linking up at Crazy Mom Quilts for Finish It Up Friday and at What a Hoot! for TGIFF. I recently wrote about the memory quilts I've been working on. Well, I managed to finish piecing, basting and quilting both of those memory quilts this week. And I have to say - they came out exactly like I wanted them to. For both quilts, I cut strips of varying widths and then randomly sewed them together into strip sets. To make the top larger, I used some solid strips between each row. The quilting is a soft, big meander. The quilts are super soft. They both measure about 50" square. Both sisters-in-law are visiting this weekend so I plan on giving them the quilts then. And I kept a few strips to make a little something for my sweetie too. I just haven't decided what that's going to be yet. I will be linking up at Crazy Mom Quilts for Finish It Up Friday and at A Quarter Inch from the Edge for TGIFF. 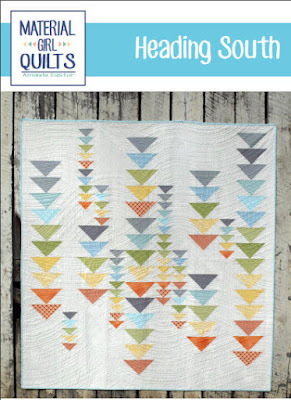 And these quilts are projects number 2 and 3 on my Q3 FAL list. I decided to make a checkerboard quilt by playing with the fabric direction. I wanted to stay small at 18" square so cut 3.5" squares and set them up in a 6 x 6 grid. I used the same fabric for the binding. I just love it! For the quilting, I went with simple straight lines on either side of the seams, about 1/4" apart. The thread is Aurifil 40 wt in colour 2150 - a really nice shimmery orange. I'm super happy with my mini quilt and loved the process so much, I'm going to try this again! Meanwhile, I put this little thing on my dining room table with the beautiful flowers my sweetie got me this week. I will be linking up this little finish at Crazy Mom Quilts for Finish It Up Friday and at Celtic Thistle Stitches for TGIFF. And this is project number 6 on my Q3 FAL List. Quarter 2 of the 2016 FAL was a huge success for me - I finished 6 out the 7 projects on my list. So I'm gonna keep going and sign-up for Q3! This project was on my Q2 list, but I didn't make any progress on it at all. So I'm rolling it over to this quarter and I am determined to finish it this time. I mentioned these quilts in my last post. I have the two quilt tops complete so I need to piece the backings, baste, quilt and bind. My deadline for these is July 23 so I really need to get going. This is a QAL hosted by Quilting JetGirl which started this month and the deadline for completing the quilt is October 7. I really don't want to fall behind on this one so I'm putting it on the list. I'll be using Kona White, Ash and Charcoal. 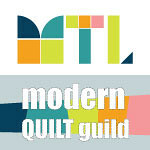 This is the June MQG Quilt of the Month designed by Cheryl of Meadow Mist Designs. I've got all my fabrics cut up - I'm using Kona Ash, Persimmon and Jamaica Blue. I'm super excited about this one and I'm hoping to get this one done by September 30. So on the list it goes! I really want to get this challenge done - I had to skip April and May and barely completed the June challenge. I chose a really cool yellow print for my challenge, I cut all my pieces so now need to sew them together, quilt and bind it. During the May is for Makers campaign, I purchased a bunch of patterns and I'm determined to use them all before I purchase any more. For Broken Frames, I'm using two charm packs of Cherry Christmas designed by Aneela Hoey, along with some Kona Red and White. This is another pattern I purchased in May and I plan on using my scraps for this one along with some Kona Charcoal for the background. Yet another pattern purchased during the May is for Makers campaign. This one involved curves and it scares the crap out of me! I chose a bunch of blue fat quarters from my stash for this one with some Kona Cloud for the background and Kona Nautical for the binding. My list for Q3 is substantially more ambitious than my Q2 list but I've got some vacation time coming up and hoping to get lots of sewing time. He was so close to his children, and they were all so very sad, I knew I had to make quilts with his clothes. So I collected all of his flannel shirts - the ones he wore all the time - and made a plan. After cutting up all the shirts, I needed a break. The whole process was extremely emotional for me and I felt drained. But I felt like I needed to sew - this hobby recharges me, relaxes me and makes me feel productive and useful. First up, I made a Two in One Pouch by Sotak Patterns. I wanted one that matches the Gathered Clutch I made for myself a little while ago so I grabbed some black and some yellow fat quarters for this project and got to work. Pretty good match don't you think? I made the two panels using a quilt-as-you-go method and I thought the batting would make the panels sturdy enough that I wouldn't need fusible fleece or interfacing, but it's a little more floppy than I'd like. Oh well... live and learn! I'll be linking up these small finishes at Crazy Mom Quilts for Finish It Up Friday and at The Carpenter's Daughter Who Quilts for TGIFF.